There are times each day when increased mental focus and fine-tuned physical movements are crucial: clearing your grandmother’s fine china and crystal from the dinner table; sipping a cola and eating a hot dog slathered in condiments while examining the rolling jewelry at a hot-rod show; clipping your dog’s toenails without cutting into the quick that protects the nail bed. Oh, and riding a motorcycle. In the above examples, only the last one will hurt or kill you if done poorly. 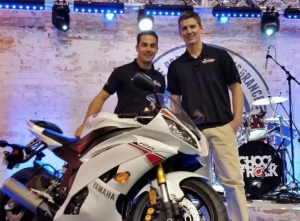 It’s my belief that championship-winning motorcycle racers out-focus their competition. They make fewer mistakes, hit more apexes, stay in the moment, and run nearer the knife-edge of traction longer than the riders they beat. At the Yamaha Champions Riding School, we talk about mental focus a great deal, and everyday life gets mentioned too. In everyday life, we have chances to “build our focus muscle” without the downsides of crashing a motorcycle. We encourage our students to, “Don’t crash the coffee,” and go on to explain that when your body is moving, take an extra millisecond to put your mind into gear prior to the movements. 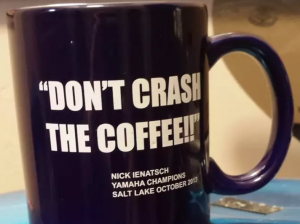 Don’t throw your hand at your coffee mug and “crash” it. Use your eyes and focus to get that mug to your lips and back without spilling a drop. This week I am encouraging you to find something you do in everyday non-riding life and make it your “can’t fail” process. If you fail at this one thing, you have crashed your motorcycle but without the pain, expense, and embarrassment of actually throwing your bike on the ground. The goal is to be able to snap your brain, attention, and focus to a higher level when it really counts: when you’re riding. The faster you ride or the worse the grip or the more-crowded the area, the more your ability to snap into the moment matters. My personal favorite: We type passwords into our computers and other devices daily. Make this your “can’t crash” process. Notice how an instant of pre-typing focus almost guarantees a successful entry. When you drive your car, truck, or van, focus on never letting the vehicle wander to the edge of the lane and onto the Bott’s dots, rumble strips, or painted lines. That is a crash. Bring this goal to the top of your mind and notice how your increased mental focus increases your awareness of vehicle placement. See how long you can hold one speed or pedal cadence on your bicycle on flat ground. Use your computer to monitor one or both of those numbers. You’ll find that when your focus slips from your physical movement, your speed or cadence changes. When you’re reaching for a glass of water on the bedside table in the dark, take an extra second to imagine where it is and then slow down your hand movement to give yourself a chance to feel the glass before you knock it over. Anytime you spill liquid from a glass in daily life, it’s similar to grabbing the front brake lever or snapping open the throttle at lean angle. You’re down. The next time you make a little slip with grass shears or paper scissors or a saw or a knife—something potentially dangerous—take it seriously as a hint of impending disaster. YCRS instructor CJ LaRoche runs LaRoche Tree Service in Bellaire, Ohio, and he works constantly with his crews on this exact subject: mental focus prior to physical movement. His employees work with chainsaws and other trimming equipment in all types of weather, high above the ground on ladders or lifts, and often around power lines where a mistake can be fatal. LaRoche speaks with his workers just like we talk to our students because mistakes with power equipment hurt like mistakes on a motorcycle. Recognize early when you are approaching something dangerous in your home, like electrical work. This recognition and pre-thought are exactly what we work on with students prior to riding. YCRS instructor Ryan Burke is a journeyman electrician and works around insanely powerful electrical grids during commercial building and system repairs. One reason he is such an accomplished roadracing champion is due to his mental preparation and training as an electrician. For some readers, this subject might seem silly and unimportant, but those who race at or beyond the edge of grip, ride in all weather conditions, pilot turbocharged bikes that wheelie in fourth gear or work as a bike messenger in heavy city traffic are nodding their heads. They’ve had drama due to a lack of mental focus on physical movements. I have, and I’m working on building my focus muscle in everyday life so I can bring the mental intensity when I need it, especially while racing Rusty Bigley’s Spondon-framed Yamaha TZ750 in AHRMA competition. Identify your “can’t fail” daily process and watch how that everyday practice improves your riding focus and performance.